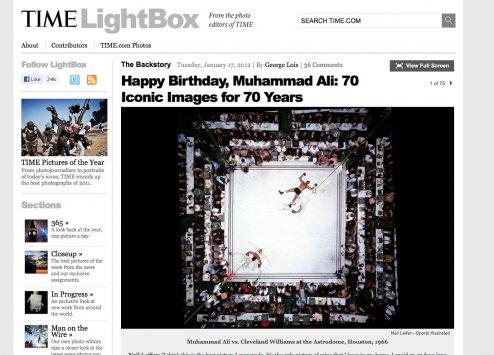 I was honored to be a part of this photo tribute + essays for Muhammad Ali’s 70th birthday. Hit here for some incredible images and stories. In TIME. This entry was written by Poole, posted on January 17, 2012 at 11:52 pm, filed under Boxing, Sports, Uncategorized. Leave a comment or view the discussion at the permalink and follow any comments with the RSS feed for this post. 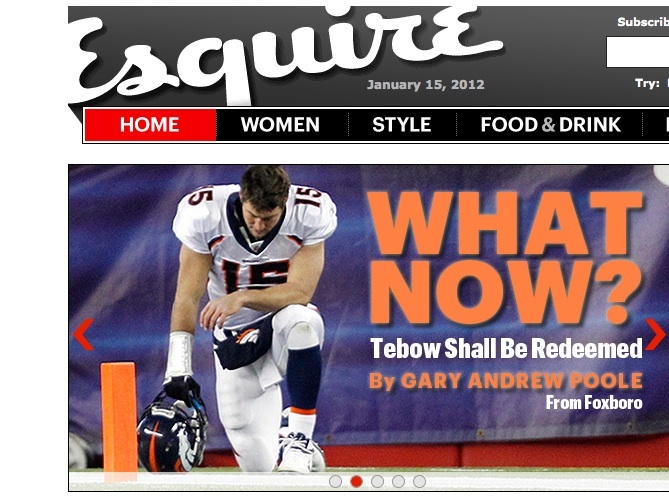 In Esquire, my story, from Foxboro, on Tim Tebow. And Gisele. Here. This entry was written by Poole, posted on January 15, 2012 at 9:39 pm, filed under Sports, Tebow. Leave a comment or view the discussion at the permalink and follow any comments with the RSS feed for this post. My article in The Atlantic about Tim Tebow. The piece is entitled “Tim Tebow Is Out of the Playoffs, but He’s Here to Stay”. So true Ms. Headline Writer, so true. This entry was written by Poole, posted on at 8:13 am, filed under Sports, Sports + Religion = $$$$ & Fame, Tebow. Leave a comment or view the discussion at the permalink and follow any comments with the RSS feed for this post.